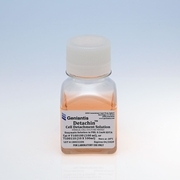 The Detachin Cell Detachment Solution is a gentle and effective alternative to Trypsin/EDTA for detachment of in vitro cultured cells. 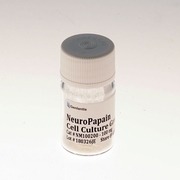 It provides a consistent, safe, and efficient method for cell detachment and dissociation. Detachin contains protease and collagenase activities in an isotonic, phosphate buffer solution with EDTA. It has been tested successfully on many different primary cells and cell lines, including: bone marrow cells, stem cells, fibroblasts, hepatocytes, mouse germ cells, keratinocytes, macrophages, chick embryo cells, neuronal cells, vascular endothelial cells, A-375, BHK, CHO, COS, D54, HEK293, HeLa, L-929, M-24, MG-63, MRC-5, NIH-3T3, NT-2 cells, U-251, Vero, Sf9 insect cells, and many others.